The success of any blog or website is almost entirely dependent on the quality of the content that it presents to an audience. And the quality of the content? That’s determined by the level of engagement it demands. New forms of rich media are bringing about new ways for site owners and operators to capture the attention of audiences and keep them coming back for more. In this article, we’ll look at five forms of tried and tested content that have been proven to boost a website’s engagement. Graphics are a fantastic way to increase visitor engagement. Infographics are particularly trendy, but less time-consuming options include things like memes and GIFs. For memes, give MEME Generator a try – you can create memes in a matter of seconds, and it whatever language you want. For GIFs, try out makeagif.com. One of the more powerful tools out there for creating more complex graphics, like infographics, is Canva. It’s easy to get the hang of, and although many of the features/options are paid, you can usually get away with something that looks quite professional without any investment (besides your time, of course). Quizzes have taken off in a huge way over the last couple of years. By their very nature, quizzes drive engagement, so use them to really drum up plenty of engagement and excitement for your site. A site like Content Tools should provide you with all you need to get started. Take a look anywhere on the Internet right now and you will see hundreds of list articles. From top 10 lists, to how-to guides on a variety of subjects, list articles are here to stay. The simple reason why people like them is that they convey, upfront, how much time will have to be invested in the article. So not only is the content engaging, but visitors also learn to trust you with their most valuable resource: time. Turn up the excitement by creating videos and podcasts for your website. They are a lot more engaging than a simple text article, and encourage people to tune in for more great content. Literally billions of videos are available online, and a large majority of these are watched by people on a regular basis. That’s the audience, and if you can tap into that you are well on your way to becoming a winner. Once you have an audience you should be able to build a voice. 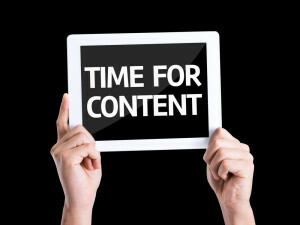 This means that at some point you can bring more opinion into your content. Whether you do this visually or through written material doesn’t matter, but opinion pieces and predictions about the year ahead, for example, are very effective at building engagement (and even a little controversy). Experienced marketers will always tell you one of the very best ways to build engagement is to bring some honesty to the table. Stories about you and how you got to where you are today are, and always will be, popular. People like other people. They like the human, personality-side of business, and if you can get that across in your content you’ll begin building invaluable rapport with your readership. Mix up the above types of content as much as you can, and you should have an attractive offering that gets people interested in your site. Try out new things, tweak existing methods, optimize, and overtime you’ll find out exactly what resonates with your audience.